Plenty in life is free, as I hope you’ve learned from the Freebie Finding Mom blog. In fact, I’ve made it my mission to uncover as many great free (or nearly free) things as possible and share them with you. I want everyone to be able to live a frugal yet utterly fabulous life. (Frugal doesn’t have to mean deprived!) One of my favorite freebies is the Fry’s Free Friday Download. This freebie is 100%, no-strings-attached, FREE. You don’t have to buy anything else, or two of something, or whatever. Just download the eCoupon, walk into your local Fry’s, and walk out with whatever item is the current Fry’s Free Friday Download. This week’s Fry FREE Friday download for one FREE RXBAR Single (1.8 oz., select varieties)! This eCoupon must be downloaded on April 5; however, you have until April 21 to redeem it at your local Fry’s store. What is the Fry’s Free Friday Download? Basically, the Fry’s Free Friday Download could be any of the tens of thousands of products Fry’s carries. You must download your Fry’s Free Friday Download eCoupon on Friday, but you’ll have a while (about 2 weeks) to actually redeem it. And that’s it… that’s the Fry’s Free Friday Download. It’s one of my favorite freebies for a few reasons. One, it’s so darn easy. Seriously, so many coupons have fine print that requires you to jump through a ton of hoops but not the Fry’s Free Friday Download. Nope, this Friday freebie is easy-peasy. Two, it’s consistent. The Fry’s Free Friday Download happens every Friday, 52 weeks out of the year. Three, it’s different. The Fry’s Free Friday Download allows my family to try new products and explore all that Fry’s has to offer. Four, I can always do something with the freebie. If my family doesn’t like the current Fry’s Food Free Friday Download, then I can give it to someone else or donate it. There’s no reason not to get this freebie! So, I invite you to try one of my all time favorite freebies…. Grab your Fry’s FREE Friday Download eCoupon now. Fry’s was founded by Donald Fry in 1954. The supermarket chain began in California. It was Donald’s brother, Charles, that helped expand Fry’s into Arizona where it continues to be a major presence today. In 1983, Fry’s became a part of the Kroger family. Note: All of the stores in the Kroger family participate in the Free Friday Download, so if you don’t live near a Fry’s you may still be able to score an awesome Friday freebie. 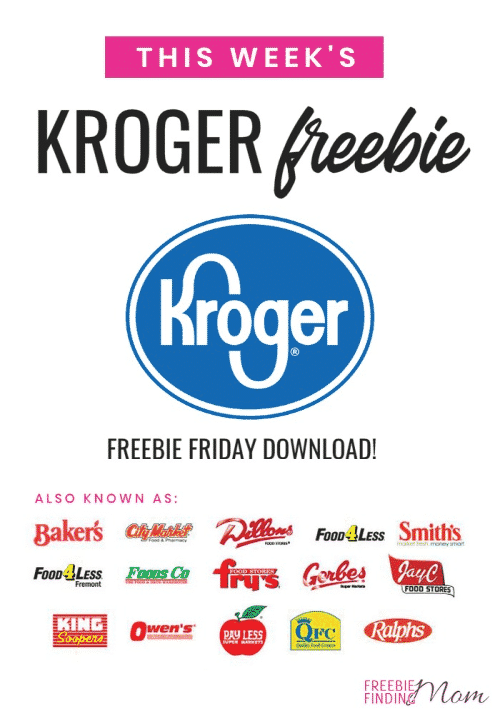 See the Kroger Free Friday Download here.